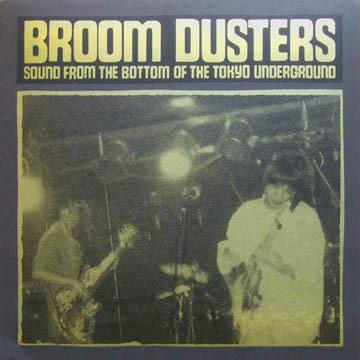 Archive in-the-red live recordings by the Broom Dusters, a Tokyo outfit led by Masami Kawaguchi in the late 1990's. The trio's sound was a jagged, lurching hybrid of amped up psych and garage blues topped off with Kawaguchi's distinctive vocals. Kawaguchi was at the time a member of Keiji Haino's Aihiyo trio and has since gone on to found Miminokoto and New Rock Syndicate. He also did a stint as second guitarist in LSD March. The collection of live material on this LP was recorded in 1998 and mastered by Soichiro Nakamura at Peace music studio in 2005. This LP only release comes in a handsome gold/black screenprinted jacket with screenprinted labels. Released in a numbered edition of 315.